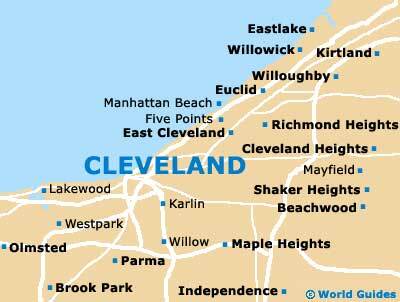 Cleveland sits at the top end of Ohio on the bottom shore of Lake Erie and is an up and coming place to buy or rent both houses and apartments. This is, in part, due to its resurgence into modernity owing to redevelopment along with relatively cheap property prices. Apart from the cheap cost of housing in Cleveland, its positioning on the banks of Lake Erie lends it excellent potential for activities and recreation. There are some fantastic neighborhoods in and around Cleveland, including a spruced-up downtown and the Historic Warehouse District. Both of these areas have an abundance of shops and restaurants, good public transport access and about the best deals in the city when it comes to property investment. Prices are on the rise in Cleveland, and although the market remains volatile, the long-term prospects of property investment here are generally good. Foreigners in it for the short-term may be able to pick up a bargain to boot. 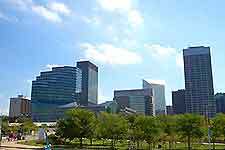 The downtown area of Cleveland is the best bet for serviced apartments. Prices here for serviced apartments are high for Ohio, yet low when compared with major cities in neighboring Michigan and Pennsylvania. Everything from studios to luxury one- or three-bedroom apartments can be had in downtown and surrounding suburbs. Serviced apartments in Cleveland means fully-furnished, with AC, heating, fitted kitchen, TV and stereo, and cleaning. Leases go from three months upwards. Finding apartments online is generally the best bet. Foreigners can buy property in the USA without restriction, although will usually be faced with high mortgage rates and insurance. Expect to be asked for a sizeable deposit from the banks. The typical added cost with buying apartments and houses in Cleveland is around seven or eight percent. Cleveland lags behind most of the neighboring states on property prices. However, you can expect to pay for the privilege of being in the downtown or historic districts. Going alone is a tough prospect in Cleveland unless you know the lay of the land. The de facto way of buying property here is to use an estate agent and there are many in town. Agents are obliged to point out costs and pitfalls and receive their cut from the seller. Progressive Urban Real Estate deal in homes, town-houses and apartments both in and around Cleveland. Based in Cleveland's Historic Warehouse District, Coakley Real Estate Company deal exclusively in upscale homes and condos. An experienced real estate agent for Greater Cleveland, Bob Zimmer covers the city well and includes the Historic Gateway Neighborhood.